Ford Green Engine paint. One litre tin. The correct colour for the 1928 - 1941 Fords. We have this paint manufactured in England. Enough to paint your engine and gearbox. Gloss black engine ancillary paint. One litre tin. This is the same formula as our green engine paint, so it is ideal for the other items in the engine bay, starter, generator etc. 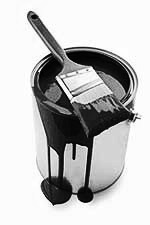 Matt black engine ancillary paint. One litre tin. This is the same formula as our green engine paint, so it is ideal for the other items in the engine bay, starter, generator etc.